It is officially winter and just because the sun goes down earlier, doesn’t mean you have to head inside. 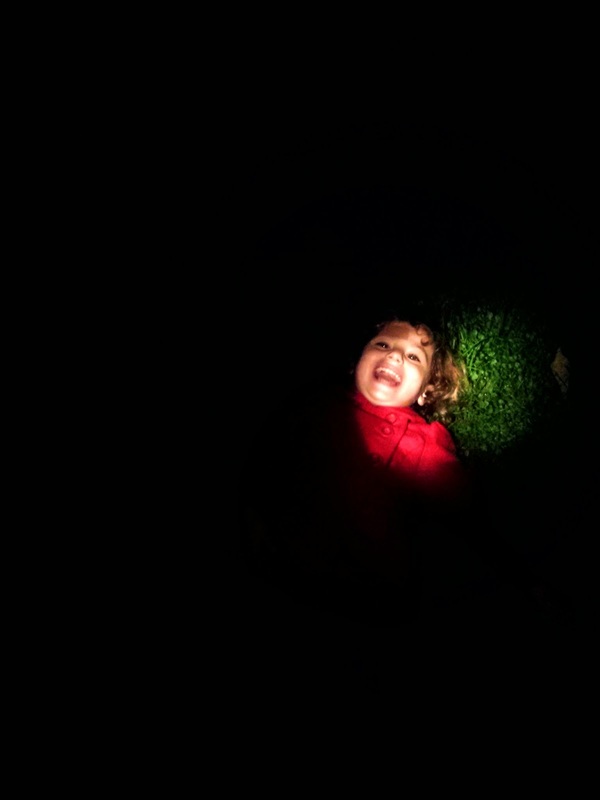 For two years, I have been looking forward to the day that my toddler was old enough to start doing a little nighttime exploration, so as soon as the fall time change was in full effect, we threw on our jackets, grabbed our flashlights and headed outside! 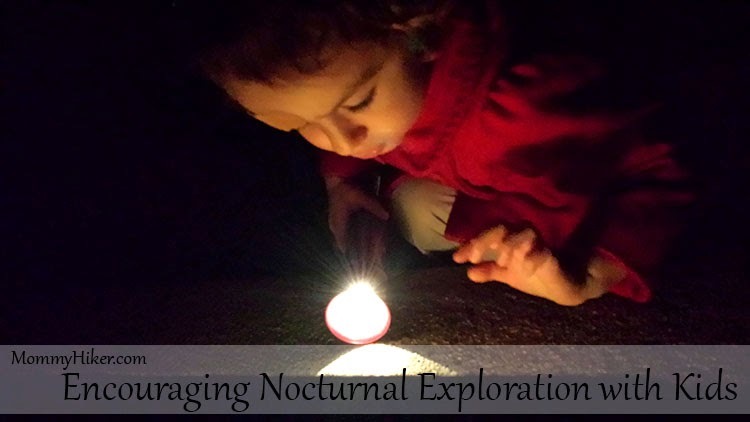 Night exploration unlocks a whole new outdoor world to a curious toddler. 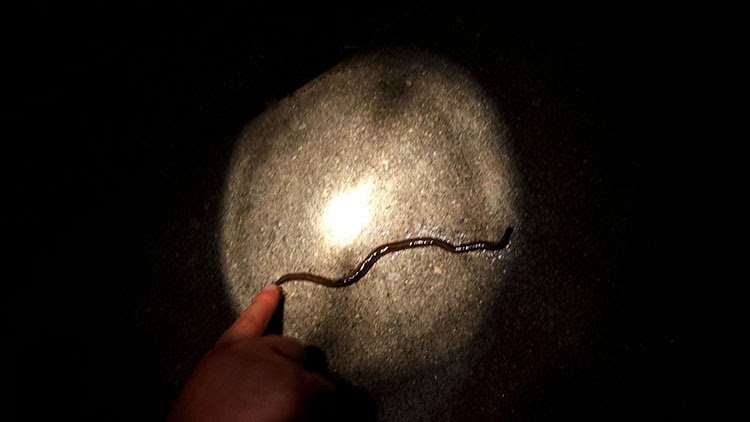 Even the most seemingly mundane things become fascinating and I’m telling you, from our very first night walk, our 2 year old was begging to go out every single evening! Dress for the weather! 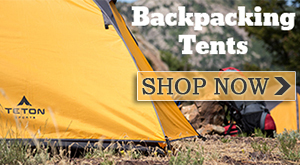 After the sun goes down, the temperature can drop several degrees in a very short amount of time, so be prepared! Grab a sweater and a snugly hat and that will ensure your walk won’t be cut short by a cold, uncomfortable kid. Check the batteries! Make sure your flashlight isn’t going to run out of juice halfway through your walk because that’s one toddler meltdown which is totally avoidable. Be safe! Make sure to wear light colored clothes and reflectors of some sort. Glow sticks are a huge hit in our family, as you can imagine. Just make sure the whole family is visible to passing cars, bikes and pedestrians. 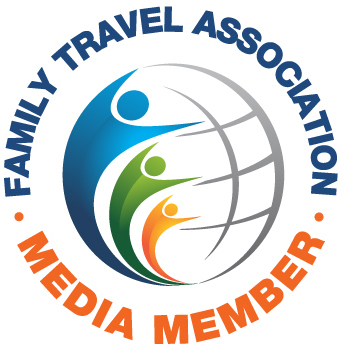 The benefits of a nighttime family tryst are far-reaching and the activities are limitless. Here are 8 that our family thoroughly enjoys! I found that one of the greatest benefits of taking our toddler outside after dinner, is to expel all of that early evening energy, making her more relaxed and ready to move in to our bedtime rituals more smoothly. We actually created a routine during our nighttime walks that almost always ensure at least 10 to 15 minutes of full tilt running. This was obviously done in a well lit area! For me, there is pretty much nothing better than lying down in the grass, cheek to cheek with my little peanut, looking up at the night sky. This activity is all about gazing up into the wide open sky, whispering secrets, telling stories, finding constellations and sometimes saying nothing at all. It’s moments like these that I live for, listening to the soft sound of my child’s breath while we eavesdrop on the hoot of a far off owl. Priceless. We are lucky to live in a place where crickets and roley poleys and worms abound. It’s probably the part of our nighttime walk that V looks forward to most. Although, trying to catch crickets might seem like a pretty futile endeavor to most adults, it’s an activity that has the potential to capture a child’s attention for much longer a time than any cartoon or mobile app I’ve ever seen! And the fervent hunt for the elusive roley poley is one that could tire even the most active kids. While out on our walk, we are always on the lookout for our nighttime friends. 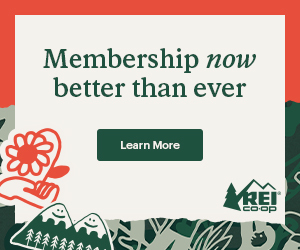 We’ve only been lucky enough to spot one raccoon so far but, just being on the lookout for them can spark a valuable and fun conversation about what it means to be a nocturnal creature, how they use their senses differently from other animals and how they live in harmony with diurnal animals. Ok, well maybe it was more like pebble hopping, but this is a must-do activity on our nighttime walks! V loves navigating these rocks, pretending that she’s a monster, over and over and over and over again. It really is remarkable how things, which in the daytime are old hat to a toddler, can take on a fantastical transformation in the twilight hours. This is something that we also love to do when we are hiking. Keep your eyes and your ears, your nose and your hands open. The night sky opens itself up to all sorts of sounds that you aren’t privy to in the daylight hours. One of my and V’s favorite is passing by our neighbor’s house and listening to the trickle of their garden fountain. Talk about serenity. This is a new discovery for our family and I can’t begin to describe how fascinated V has been with this new found activity. Watching and understanding the different phases of the moon has allowed V to begin to recognize the bigger picture of the earth and how we fit in to the solar system. We printed out a simple moon tracking sheet and take it with us on our night walk to sketch that night’s moon. Being that it’s the holiday season, I would be remiss not to mention the abundance of lights and festive decorations that adorn houses and buildings in neighborhoods all over the world. Go out, celebrate life’s beauty. There is much to see, even when it’s dark out! Happy Holidays! Now it’s your turn! 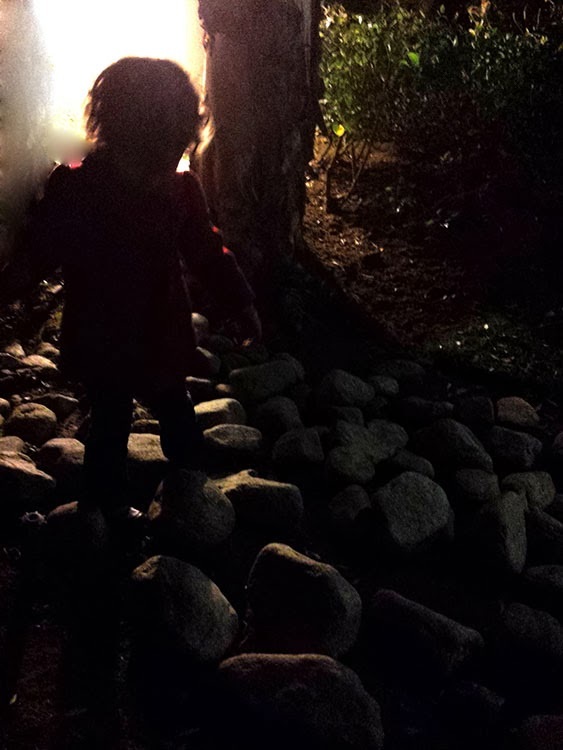 Does your family have a nighttime walk ritual? What are some of your favorite activities? Love your post, reminded me of a winter festival we visited a few weekends back. 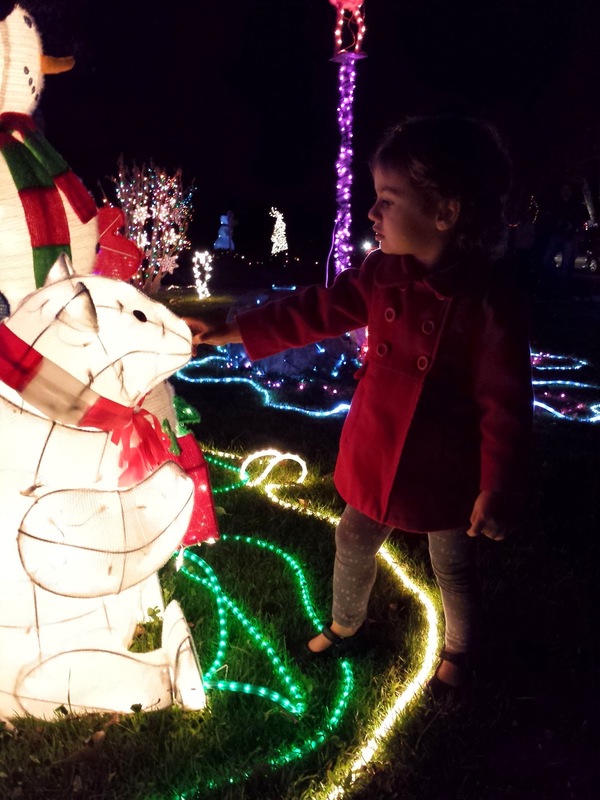 Our little one loved all the lights and hasn't been afraid of the dark ever since! Just dropping by to say “hi”, and wow! LOVED this post!! 🙂 We are on track for a record breaking month of low temperatures in December, here in Western Colorado. But as soon as that eases up a bit, we need to give some of these fun ideas a try. awwww, what a sweet note. Thanks so much Tami! Hope you had a Merry Christmas! Thanks so much! Definitely the most wonderful time of the year! 🙂 Happy Holidays to you, too!